Thankfully Governor Bobby Jindal vetoed the excessive legislative pay raise today! After the announcement this morning, I noticed something extremely interesting: voters were glad, but still expressed reservations about what kind of statement Jindal was making. This made me think, which is dangerous. There is a question I have to ask. Is Jindal our Whiz Kid or our Hero? What legacy is he trying to leave as governor of our great state? Whiz Kid? A whiz kid is defined as a young person who is exceptionally intelligent, innovatively clever, or precociously successful. This was the nickname given to Jindal by former governor Mike Foster. There is no doubt Jindal is intelligent and successful. He has catapulted himself to success quickly rising through the ranks of political circles to become one of the youngest governors of the state of Louisiana. He attempted to be clever in handling the potential veto, but didn’t accomplish his initial goal which was to have legislators decline a pay raise or to ask him to veto the bill. He wasn’t such a Whiz Kid in the current scenario. Hero? By definition, a hero is someone with great strength or courage with a nobility of purpose. 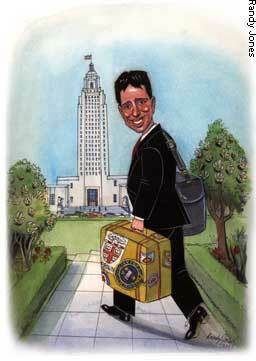 I cannot call Jindal a hero because he apparently vetoed the bill only to save his own political future. Sure, he spoke against the pay raise, but chose to wait until the eleventh hour to make the right decision. In his speech Jindal never said what we wanted him to say: “The people have spoken and we serve the people.” Instead he said the pay raise was not in line with ethics reform. The real pain came for the voters when he waited so long to veto the bill. No hero here. Or is there? Heroes also inspire, win battles against all odds, are leaders, set examples and are the pacesetters. They come in all shapes, ages and colors. Political heroes include Abraham Lincoln, George Washington, Dwight Eisenhower, Harry Truman, John Adams, Teddy Roosevelt, Ulysses Grant, and Thomas Jefferson. Inventors are heroes. They are the likes of Thomas Edison, Henry Ford, the Wright Brothers, Alexander Graham Bell and Eli Whitney. Heroes are creative, powerful, persuasive individuals that make their mark in history. The list is endless from Rosa Parks to Albert Einstein and from Sam Walton to Bill Gates. People listen to heroes, they emulate them, and they know them by the intensive passion to fight for what is right and good and true. They apparently do not make decisions based on political futures, but on the matter at hand. So, at the end of the day, what is most troubling about Governor Bobby Jindal are the weeks of delay that he spent toiling over a decision to veto or not veto an unacceptable pay raise. We are so very glad he chose the better part; however, we are perplexed to figure out whether he truly is a Whiz Kid or just longs to be a hero for the people. If he is choosing to be a hero, then we need him to act quicker, firmer and with more resolve in the future than he has in the past. Jindal is charting his political legacy each day. Let’s hope he learns from the past and makes decisions that leave a legacy both he and the voters can be proud of for years to come. Our legacy depends on it.